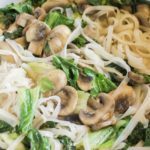 CHINESE Bok Choy and Mushroom Noodles is DELICIOUS! This healthy recipe is made in 15 minutes and makes Asian cooking easy! 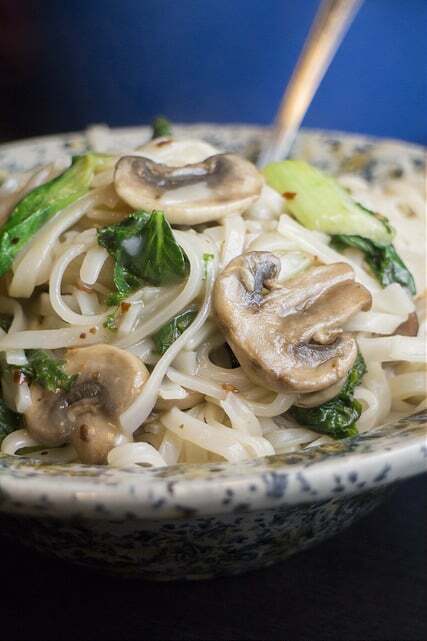 These noodles are vegetarian, spicy and simple! We love this dinner in our house! 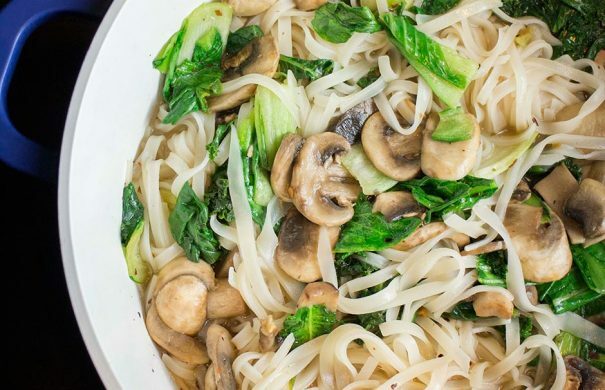 Lately I have really been in the mood for a big bowl of Chinese noodles full of vegetables so I cooked this Bok and Mushroom Noodles dish one night and now it’s a official staple for dinner. I love that I can use both fresh bok choy and kale from the garden making this a healthy vegetable dish too! This Chinese dish will only take you 15 minutes to make so it’s a easy meal to make on weeknights! The red pepper flakes and ginger add a little spice that goes a long way for flavor. These noodles are not soupy as the broth will boil off and the rice noodles will soak them up. 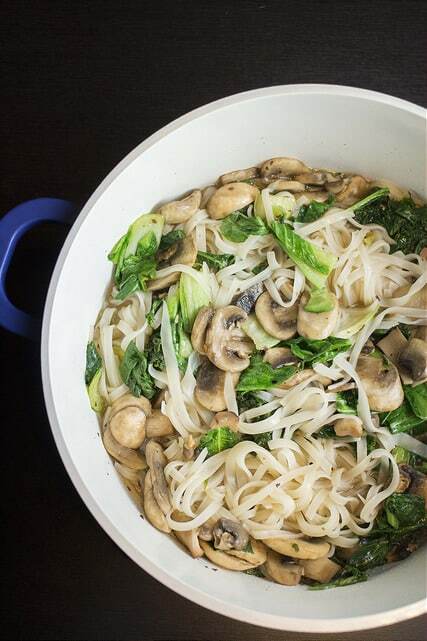 Hope you enjoy these simple and healthy Bok Choy and Mushroom Noodles! In a large pot bring chicken broth to a boil. Once boiling add rice noodles, cooking as instructed on noodle package. When the noodles have 4 minutes left, add vegetables and stir. Season with salt + pepper if needed. NYC Garden Party Pictures and Fun! A divine easy tasty dish,… Yum Yummm! I like bok choy! Just made a soup using a whole head as well! Although I’d rather have your stir fry. It looks fantastic! Ooo these noodles look so good! I seem to always always have extra kale hanging out in my fridge – perfect way to use a bit up! Hi Pamela, great veggie dish, love bok choy and kale but never put them together in a dish before. Genius! This has all of my favorite flavors! Looks fabulous! Love bok choy! The noodle dish looks very tasty and comforting, Pamela. I’m a sautéed veggie girl, too! This noodle dish sounds delicious, Pamela! wonderful reminder that I am wrong wrong wrong—-which is good. It’s certainly making my mouth water to look at your pictures Pamela, so fresh, healthy and delicious looking!! What a delicious slurpy looking noodle dish. Full of some of my favorite flavors. i like dishes like this too Pamela. I have some baby bok copy in the crisper and I feel the need for some more noodles! This looks so good and warm and comforting! I wish I could grow mushrooms because I eat SO MANY. I am ready to attack that beautiful plate of veggies and noodles! Yum! I love your cute kitchen! OK now I’m in the mood for a big bowl of Chinese noodles too!! Love the look of these delicious and vibrant greens. 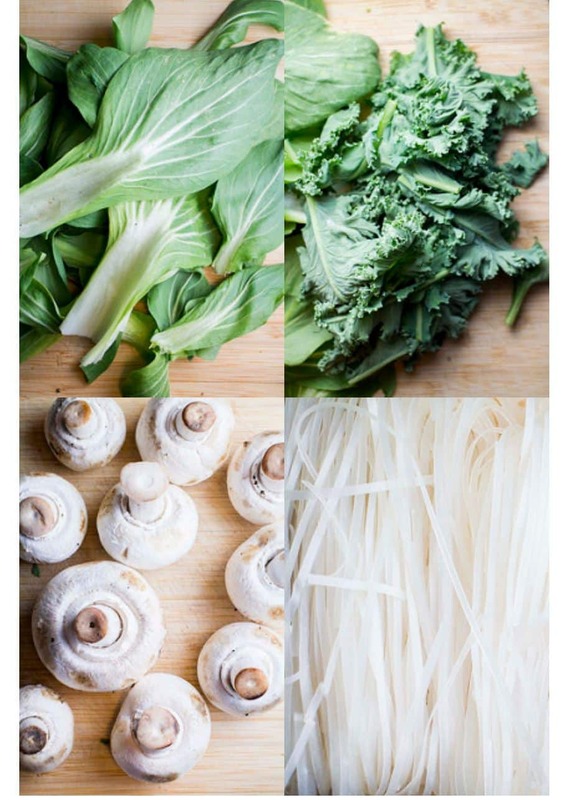 Noodles are my ultimate comfort food and with delicious home grown produce like yours, it would only get better & better! This is lovely! Such a good idea for a quick and healthy springtime meal! Love this recipe Pamela! Bok Choy and kale taste so good spicy! These noodles seriously look so fantastic!! Holy bajinkas… get in my belly. This dish looks absolutely divine. Yarm! I love everything about these noodles! 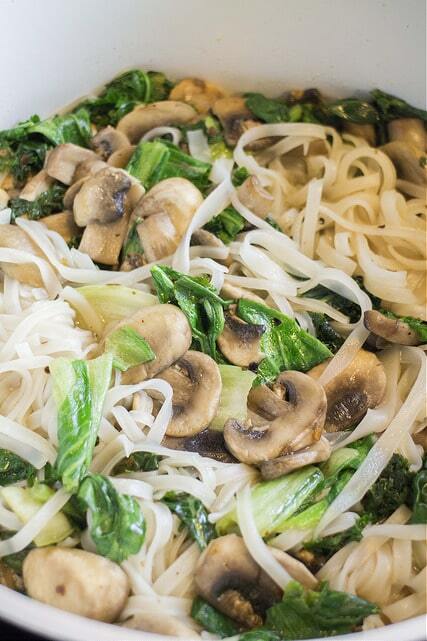 You can never go wrong with Chinese noodles and veggies. So good! Wow this sounds like such a comforting bowl of goodness! I have the same lowel ego lamp! I made this dish for dinner last night. My fiance and I both LOVED it. I omitted the ginger, added fresh spinach, chicken and rice vermicelli noodles as these were all I had. I also wanted it to be a bit more soup like so I added approx. 2 cups of water with a bit of low sodium soy sauce mixed in. It was absolutely delicious and very quick to prepare. I will be making this again and again in the future. Thank-You!! That sounds delicious Katherine! I love that you made it into a soup (I’m going to have to try that with some udon noodles!). Enjoy the noodles Joyce! Hope your family has a great dinner! Thanks so much for commenting back Joyce! Shrimp sounds like a delicious addition!